I would always say: "Good, but I can do even better!" This is a motto of my everyday life. I like to create simple things, but it is the most difficult thing to do, since simple things cannot be manipulated. Living in France allows me to work with quality products borne by this rich region. Here, I am also challenged by people who have a real passion and taste for pastry. To achieve this goal, it is essential to maintain simplicity. I appreciate this place for sharpening my inner sense and being a permanent source of inspiration. Chef patissier of Patisserie Sadaharu Aoki in Paris. Born on July 1, 1968 in Tokyo. 1991: Arrived in France. Worked at Jean Millet's and Couderc's restaurants in Paris, and at Girardet's in Switzerland. 1998: Opened his first atelier in the 7th arrondissement of Paris. 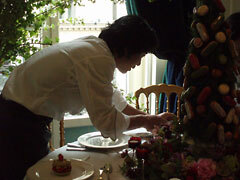 1999: Moved his atelier to the 13th arrondissement, making pastries for tea rooms, restaurants, hotels and receptions. Started delivering his pastries to mode creators during Paris Collection such as Kenzo, Yohji Yamamoto, Chanel, Ungaro and Christian Dior. Became responsible the French office of the Federation of Japan Confectionery Associations. Also became consultant for major food companies. 2001: Opened his first boutique in the 6th arrondissement on December. 2003: Opened his second boutique in the 5th arrondissement and integrated the atelier and office. 2004: Opened his corner at Galeries Lafayette Gourmet. 2005: Requested by All Nippon Airways (ANA) to serve the dessert for its business class flights departing from Paris. Opened his first boutique in Marunouchi, Tokyo in March. 2006: Opened his second boutique in Tokyo, at Isetan department store.